“World's Oldest Liar Dies at 126.” The Imperfectionist seems to have great openings for its every chapter that signals,” Yes, this is about journalism.” A little tricky and conceiting, this first work of Rachman proves a very humane side of every journalist, despite of their race with deadlines. Throughout the pages we are taken to a grand tour of Rome—where the newspaper’s headquarter is located, with short visits to Paris and Middle East. All journeys, of course, are in journalistic manner. The story itself circles around the occasional peaks and surprising, if not depressing, lows of the editorial team who work for an English newspaper based in Rome, covering extensive news from all around Europe. From contributor, to newly recruit, to Editor-in-Chief, just like another side of the coin, their personal lives are presented raw, honestly, and rather brutally. Something does happen behind every headline, and this book tries to take a pessimistic-realistic route to bare it all. Name it: disappointment, cheating, vengeful competition at work, affair, desperation—a series of unfortunate events is unfolded in one neat phase, yet unexpected. Narration swifts abruptly from one event to another and by the end of the chapter some details are left to be wondered at. The Imperfectionist comes across slightly soap opera-ish, one irony after another, one romance after another, until we no longer believe who the hero actually is. Within each episode, darkness that we are actually familiar with is inserted. That is, probably, the poise of the book. 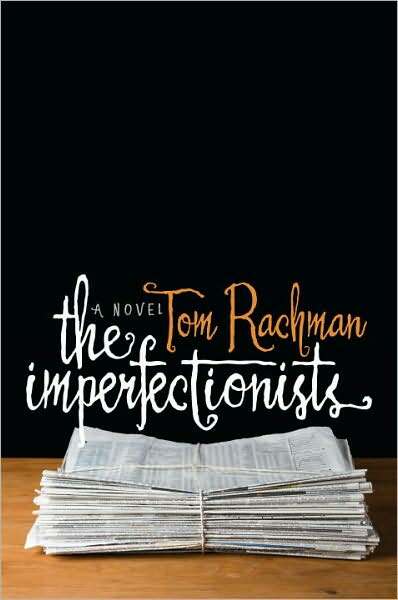 Besides, Rachman, who shares similar background with the New York bestseller's hit maker, Malcolm Gladwell, presents the story independently, as each chapter can be read separately. Remember Outliers and What the Dog Saw? This novel is the fiction version of it, Note that only the formula is adapted. Nothing else is. So, sparing some time to dip in journalism 101—The Imperfectionst's version, is quite an ace. Not only that tickles our opinion on the people behind the newspaper we subscribe to, but also there is some kind of relief that we are not journalists. Or at least you are not. Whoever ready to handle the romanticism of deadline can certainly enjoy the novel, as I am heading to my second round.